Vic: Recently, while raking leaves that had finally fallen off of a Japanese Maple, I brushed against a nearby Yew shrub. I don’t know if the lighting was just right or it’s just something that I had never noticed in years past, but the puff of dust emanating from the yew was considerable! Given that I’m wanting to prune the yews substantially, is there a period of time when the pollen production subsides, or is it around throughout the season? I would prefer not to get pollen all over me and my clothing as I’m reaching in to prune the shrubs. A search online didn’t provide me with an answer that was satisfactory to me. Doug: It’s those male flowers on the yew that are producing all that pollen. It doesn’t last long though. The nice thing is that they can be pruned from now until July or a little later. Just wait until the male flowers fall off, it only takes a couple of weeks. Then cut away! Brian: I experienced a bad case of artillery fungus the past two years with my natural shredded wood mulch both years from the same supplier. I am looking at using either leaf mold as a mulch this year or possibly trying to get mulch from a different supplier. My questions are: is leaf mold an acceptable mulch? I plan on reapplying annually. Also is my artillery fungus due to my environment or do you think it could be due to where I get the mulch? Thanks for any insight you can provide and keep up the great work! Doug: Leaf mold will be a fine mulch as long as you like the look. If you have mulch in place already that’s infected with artillery fungus, there’s some research that shows adding 40 percent mushroom manure will stop the fungus from reproducing. Another option is to use big pieces of pine bark that stay dry, that’s the difference. That artillery fungus loves wet mulch, and it doesn’t have to be cheap mulch. It can be any mulch and so when we supplant it with this, we use these big giant things, it dries out and the fungus can’t spread. Carol: We have a bank in the front yard that is covered with ivy. But the last several years we have an increasing number of thistles growing as well. How can we get rid of the thistles and keep the ivy? Doug: That’s one of the toughest problems in any garden. One thing for sure: don’t try to pull that thistle because you’ll just be making more. The best way to deal with it is continual top cutting. Every week run the weedwacker just above the ivy to remove the thistle. You’ll win the battle by exhausting the plant, but it won’t be easy. Wish I had better news. 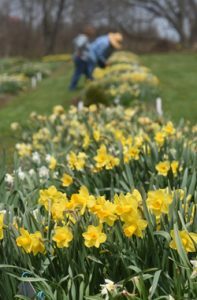 Joseph Hamm’s Daffodil Hortus in Washington County is one of the greatest collections of daffodils in the state. Alice: On the radio recently, you mentioned someplace that had a great variety of daffodils to see. I did not get the name or address. Also I think in the past you mentioned a place that had daffodils in the shape of a cross. My mother and sister who are really into flowers and gardening are visiting from out of town. They have been to Phipps several times. I am trying to think of another place to take them that might be interesting. Any suggestions. Doug: The first place I mentioned on the radio is Joe Hamm’s Daffodil Hortus. You can get all the information right here. It’s one of the greatest collections of daffodils in the state, and it’s free to visit. The second place is along Warrendale-Bayne Road near I279 In Marshall. For years the cross of daffodils along with the message “welcome spring” were on display at the family farm of John Frey. After he passed away, the land was sold for a housing development. A boy scout at the time, Jeremy Corll, moved them down the road to Mount Pleasant United Presbyterian Church on Mount Pleasant Road in Marshall for his Eagle Scout project. His father, the Rev. Dr. Daniel Corll, is the pastor at the church. You can still see some of the original daffodils as the housing development didn’t affect them. Take I279 north, turn left on Warrendale-Bayne Road and keep a look out on the right for the daffodils. The church is just a little ways down the road. Sandy: I have a truckload of rotted horse manure (over a year old) that I plan to top my garden with as my soil has a lot of clay. When it arrived, it’s not as black as I’m used to seeing and I noted a large percentage of the compost is old sawdust that was used for the horse’s bedding. Will this still be a good medium for vegetables to grow in? Doug: Yes, it will be fine. The only issue ever with well-aged horse manure is the weed seeds. I wouldn’t worry about that though, as the benefits of the manure far outweigh some weedy sprouts that can easily be pulled out.